Roxy Music Live is a record of how this great group sounded on the 2001 world tour after being apart from 1983. Until this album, Roxy Music have been relatively poorly served by the quality of their live albums – Viva, Concerto / Ladytron and Heart Still Beating. I think plenty of people have been burnt by the confusing releases from the 1979/80 tours. My Rating – 24 out of 30 (that feels stingy but it’s what the three individual ratings add up to). This album does a terrific job of representing the two sides of Roxy Music, the innovative art rock band of the early 70s and the smooth, romantic sound of the early 80s. This set list puts more emphasis on the art rock side of Roxy than anybody had any right to expect in the reunion concerts and they’ve done it by missing off some big hits from the later years. There’s no dilution of the Roxy experience with Bryan Ferry solo tracks as there has been on some of the compilation albums. Thanks Roxy. I appreciate it but what I really want is a comprehensive live album from 1974 or ’75. To be fair the later Roxy tracks fit into the set list very well and are nothing like as jarring or sleep inducing as you might expect. It feels very well balanced and paced. That’s why I give the set list 9/10 and even an early Roxy live album might not have the tracks I want. This band isn’t the fiery but so cool group that appeared in the VIva album where the songs were brooding and intense. Roxy Music have become very slick and professional with expert performances that are very satisfying to listen to. This album represents Roxy growing old very gracefully, happy and proud of both sides of their recording legacy. The music still sounds very exciting. No one else has closely imitated Roxy and the songs feel fresh and new, even thought they were twenty odd years old when the album was recorded and now thirty years old. This is where Roxy Music Live starts to run into a few problems. First, it’s a compilation live album made up of the best tracks from different concerts on the tour rather than one particular gig. This always feels a bit of a cheat to me but at least it means you get consistent performance levels. Second, the backing band do a good job of supporting the main men – Ferry, Manzanera, Mackay and Thompson – but I’d prefer to have Brian Eno or Eddie Jobson as the real Roxy Music. Purists will plump for Eno. Third, this album is recorded over 25 years since their peak. I appreciate the reunion gigs but no matter how good the performance, I know the group are middle aged and even older than me. That didn’t matter in the seventies but I know the aches and pains of middle aged life and it doesn’t feel very rock’n’roll. Fourth, the album cover. I know it’s not as important with CDs and downloads but that’s not a Roxy Music cover. Silly but the early Roxy covers were exciting for a teenage boy. On the positive side, the sound is excellent with Ferry and all the instruments very clear in the mix. This is a very good live album from late period Roxy Music and I really wish I’d seen one of the 2001 gigs. I play it a lot and enjoy it, usually hitting the replay button once or twice. If you’ve been put off getting this because of the 79/80 live albums, then you’re in for a treat if you play the mp3 samples on Amazon. This is a very classy version of Roxy Music live with a terrific set list. In some ways it reminds of Pulse by Pink Floyd. It’s a very good live album but just not the best that Roxy Music can do live. I long for an upgrade to the Viva live album or even better separate releases for the 1973, 74 and 75 tours. This album hasn’t appeared on any of the greatest live albums lists. No Roxy Music live album does. There aren’t even many reviews on Amazon and they’ve screwed up on both the .com and .co.uk sites by combining Live with Live At Rainbow Music (from 1979) which makes a nonsense of the weight of public opinion. 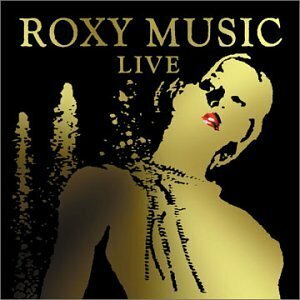 Do you think that this is the best Roxy Music live album or do you prefer one of the others? What Are The TWO Best Live Albums By Roxy Music? This entry was posted in 2000s Live Albums, Art Rock Live Albums, Classic Rock Live Albums and tagged 2000s Art Rock, 2000s classic rock, 2001 live albums, 24, classic rock 2001, Live Rock Albums With Saxophone, Roxy Music Live Albums by Paul Simister. Bookmark the permalink.